This is the continuing saga, and final installment, of my quest for an entry to Poppies Fabrics RJR Challenge Quilt. 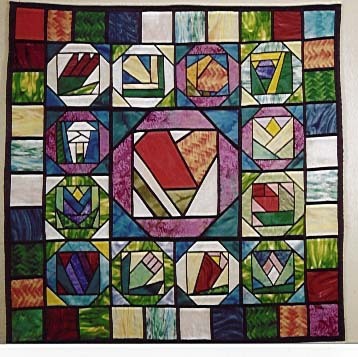 The book is "Shadow Quilts" by Patricia Maixner Magaret and Donna Ingram Slusser. 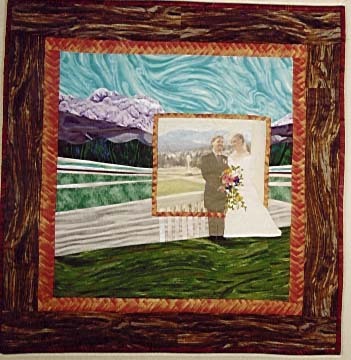 While it does have a few quilts you can duplicate in it, it is mainly a concept book: taking the individual block design and essentially enlarging it so the design becomes a huge background "shadow" .. sorta like a watermark on paper. It's an intriguing concept. The design from their book that caught my eye is called "Passing Through". 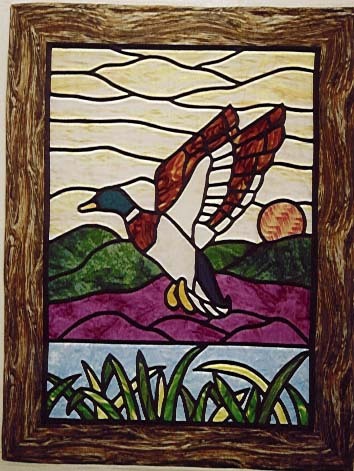 Since I was making it out of the Stained Glass fabric, I called mine (obviously), "Passing Through Stained Glass" ... and the final result is what you see at the top of the page. The fabrics I chose were blue, pink/fushia and tan/brown. This is where my second mistake took place (you knew there was going to be another one, right?) 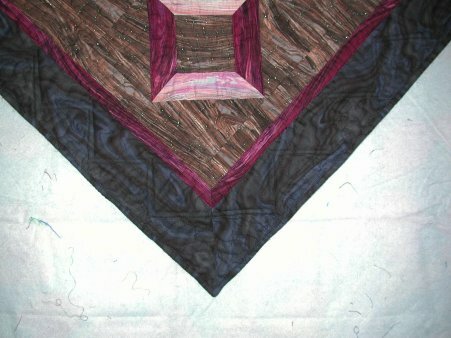 It wasn't until I sewed the first blocks together and put them up on my design wall that I realized that ... doggone it! ... these were directional prints!!! AARRRGGGHHHH!!! To my utter digust and annoyance, I realized that I was going to have to frog-stitch some of them to get the direction of the print going the correct way. Meanwhile, back at the sewing machine ... the actual block construction wasn't so difficult, though there are a lot of set-in seams. It was keeping track of what color went where that caused me the most grief. I had completed all 4 of the blocks that are at the outer points and had put them up on the design wall, when I noticed that the color wasn't flowing the way it should have. Well.. drats (and other expletives deleted) .. I had sewn the wrong colors in the wrong areas! [sigh] Time for some more frog-stitching. At this point, I decided I better lay off the Kahlua and cream. Paying more attention to what color went where, I was able to successfully finish piecing the top without any further mishaps. In addition to being careful to match all the corners, etc and accurately sew the set-in seams, I was now focused on ensuring that the lines of the brown/tan sections all went in the same direction. Also, I made sure that the brown float borders were going in the same direction as the areas they were adjacent to. I'm still a neophyte when it comes to home machine quilting, so this is an area where I don't experiment too much, at this time. 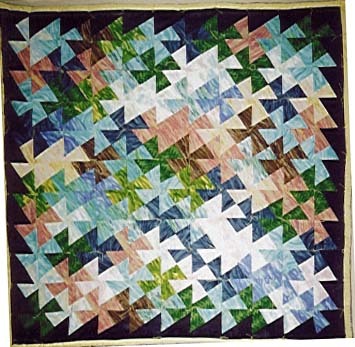 I simply duplicated the quilting that was shown in the book: the pink/fushia blocks were stitched-in-the-ditch with like-colored thread; the blue areas were horizontally or vertically stitched, depending on their orientation, in like-colored thread; and the tan/brown areas were stippled in Superior Threads "Glitter" (color 114), which is a holographic thread and looks rather like an oil-slick on the freeway. Stippling is still a stressful quilting technique for me simply because of the randomness required and I was pleased when I finished that part of it. The quilt looked as though it were going to lay flat quite nicely, so I bound it with bias double fold binding in the dark blue. I was annoyed when I realized that this was turning out to be a very friendly quilt ... those darn edges were waving at me! 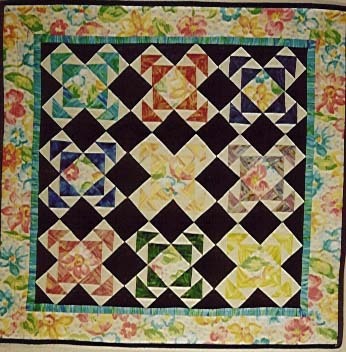 The expert I consulted for this problem said that there was an uneven amount of quilting that was causing the edges to ripple. 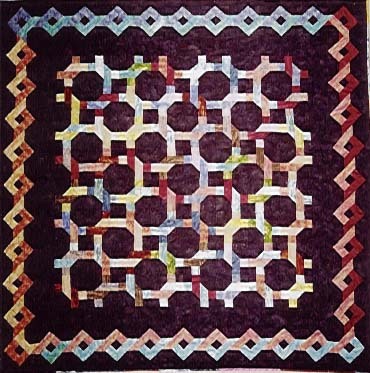 To help allieviate the problem, I needed to put more quilting in the border area. I did so by duplicating the points of the boxes as triangles and stippling in dark blue thread along the outer triangular areas. 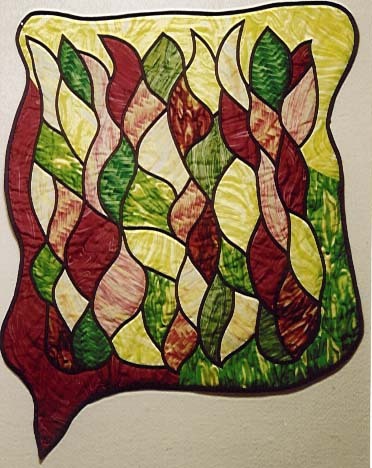 This seemed to bring the rippling down to a manageable level, although the quilt still doesn't lie absolutely flat. For the backing fabric, I originally thought of using a stained glass design fabric, but none was in stock in the store. Fortunately, I was able to find a Nancy Crow fabric, appropriately titled, "Optical Illusion". Notes as of October 2001: Poppies Fabrics finished the judging and a generic email went out to all of their customers on a Friday: results would posted on their website the following Monday! Oh my .. talk about an agonizing wait! Bright and early Monday morning I looked at the website .. no results. Checked again a little while later. No results. I called them mid-morning and found out that they were working on the website even-as-we-spoke! Oh good! :-) Checked the website at lunch time ... no results. [sigh] It wasn't until late afternoon that I got a specific email announcing the website had been updated with the results.